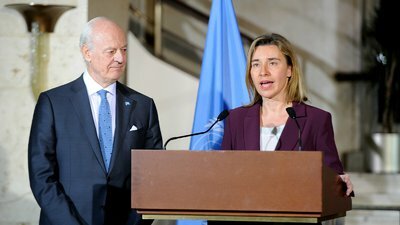 The EU’s foreign policy chief Federica Mogherini met with Syria’s regime and opposition… (23 March) to underscore the urgency of a political solution in the country, especially in the wake of the Brussels attacks. “It is important not only for the Syrians, but for the Europeans that this process starts, works and delivers,” Mogherini told journalists. She added that Tuesday’s (22 March) bombings in Brussels, claimed by the so-called Islamic State group, had put renewed focus on global efforts to combat the jihadists. “If we want to tackle this threat, we need… to accelerate and consolidate our common work to put an end to the war in Syria, and concentrate our forces on (IS),” she said. The EU official stressed that the Jaafari meeting did not imply a change in Europe’s stance towards President Bashar al-Assad’s government. Asked if the EU still insisted on Assad’s departure as part of any peace deal, Mogherini said, “the European Union sticks to the common position it has… on the need for a political transition in Damascus. Damascus has ruled out any discussion of Assad’s fate and described his departure as a “red line” for the talks. De Mistura is due to hold another day of talks today before a scheduled pause, with negotiations due to resume next month.